Net neutrality was designed to keep the people able to access the internet in any way they wish - but now that's going to change. This isn't going to be a whole explanation on why net neutrality is a good thing. Rather, I want to talk about the effects of what the next era of the Internet is going to be. Of course it won't all be at once, but slowly we will see changes from the way we browse the web to the way we communicate with each other. The issue relates to freedom of speech and expression, both of which certain people in high offices would sooner see abolished, judging by what they've said. The internet was built as a way to communicate and share ideas, knowledge, videos, pictures, and in more recent years, memes. But now, the future is uncertain due to the freedoms now granted to the companies who want more money out of the poorest citizens. The FCC does have regulations passed between the 1990s and the 2000s pertaining to keeping the internet free and open to the people. However, during this time, companies were overcharging customers and even slowing down bandwidth depending on the browser and even the location. People sued, and usually won against the corporations. At the dawn of the 2010s, when the internet culture hit its renaissance, a movement sprung up for net neutrality – regulations that prevent internet service providers (ISPs) from blocking access to websites and data if customers did not pay extra charges. Barack Obama signed net neutrality into law in 2015, following the FCC and Congressional votes to approve it. Since then, no matter your provider, you see the same sites at the relatively (as with anything) same speed as someone with another company. Fast forward to the 2016 election, where Donald Trump actually said that he wants to “shut off” parts of the internet to the American people as part of his plan to stop ISIS – despite admitting that it would infringe on freedom of speech. This would not be a bad concept – limiting the purchase of domain names by known terrorist cells, but that is almost entirely impossible, considering the internet is not a land of law and order, much less is it designed to be country by country access. Now, the current FCC chairman, a Republican working for Trump's administration has been outspoken against net neutrality, saying it's bad for the companies. Because they aren't charging people extra to go on Facebook, listen to music, search on Google, or even read this very article. Of course there are the other regulations and policies, but if net neutrality was voted out with a 3-2 majority (voting on party lines because no matter what you feel, the party – read Republican party – makes the real choices here). It should also be noted that without regulations like this, ISPs will be able to limit the websites people see, and much like suggested ads, it's based on demographics. Rich customers who pay for the premium services will be able to look for a good lawyer, read up on workman's rights, apply for certain jobs, etc. But poorer customers, who can't afford the extra, will get a very limited internet. Essentially, if you'll pardon the comparison, it's like EA's Battlefront II. You buy it, you bring it home, load up the game, and lo and behold, you can't play as Darth Vader unless you do one of two things: play for ten hours straight a day for a week or two, or just buy all the lootbox packs and spend over two thousand dollars on a video game. If you aren't able to pay, you don't get to have all the features. But as with most things they do, the Republican party really knows how to convince their base otherwise. By saying the companies won't actually charge you, they'll keep their prices the same, or that sometimes we have to sacrifice freedom of expression in the name of security (“for a safe and secure society” to quote Emperor Palpatine), as well as really pushing the narrative via Fox News and other right wing sources, they can totally blind people to the reality that they are not seen as real human beings by the current administration. This is how the internet works in North Korea and China – heavily censored, and in the case of the former, only certain people have access. We won't see it all at once. 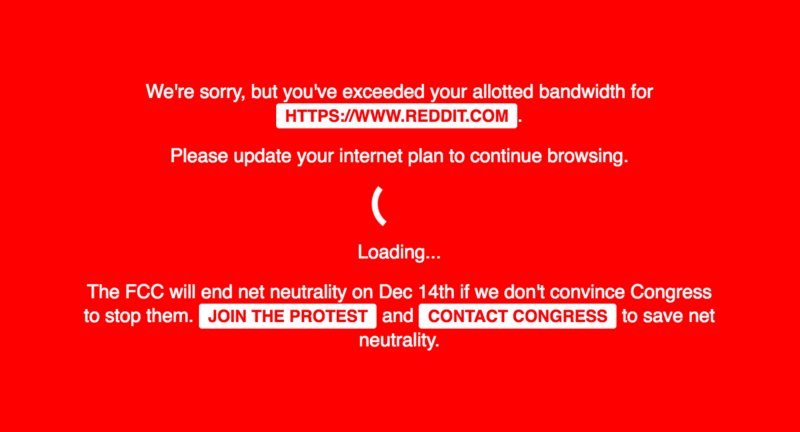 Little by little, it'll load up slower, data won't go through as fast, and then eventually a message - “To access this site, please upgrade your service package.” The companies would decide what we see and when we see it, which as we can easily infer will be abused by CEOs being paid by government officials to silence resistance. I won't go on for long about this. There is so much online and so much to read about that it is impossible to summarize in an article like this. The FCC voted it down, but Congress still has to vote. Several states are suing the FCC to reinstate net neutrality, among them Mississippi – because the Republicans screwed up so badly, even the deep south is suing them for it. Everybody should get access to the complete internet, regardless of provider, demographic, or package. It may well come to a point where to apply for a job, you have to pay your ISP more. So many things are connected to the internet, even fifty dollar smartphones. Should one have to decide whether or not they want to have an email so they can check for an important notice, or eat? Should the poor get poorer trying to go on Reddit or Google or Netflix, and the rich get richer by exploiting the poor? Seriously, the current administration doesn't care about the regular person, only the CEOs and boardmembers who lied, cheated, and stole their way to governing our daily lives. Call your senators, your representatives. Email, send a letter, anything. Tell them that these freedoms are guaranteed to all Americans, and that the corporations should not have any more right to block access than anyone else.